With over two decades of classroom experience, Michael Passer knows how to guide students through the ins and outs of research methods in ways they can actually understand and put into practice. In this remarkable text, Passer’s experience leads to chapters filled with clear explanations, resonant examples, and contemporary research from across the breadth of modern psychology, all while anticipating common questions and misunderstandings. This edition features new full-page infographics summarizing key concepts and fully updated research. 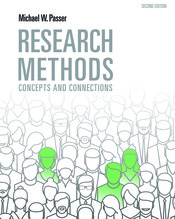 It can be packaged FREE with Worth Publishers’ LaunchPad Solo for Research Methods—the ideal online component for the text, featuring videos and activities that put students in the role of either experimenter or research subject.